The entry-level MUV from General Motors is up for a face-lift. The spotted new Chevrolet Tavera near the GM India’s Talegaon plant keeps us abreast with the plethora of changes brought into the new version. The exterior facelift apart, the real makeover is with the 2.5 L diesel powertrain under the hood. A 2.0 L Sonalika Rhino engine will replace the 2.5 L diesel powertrain in the outgoing model. The new 2.0 L diesel engine meeting the latest emission norms is capable of producing 100 Bhp peak power and 240 Nm peak torque. 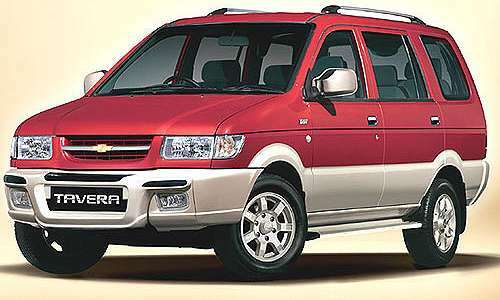 Now, the new Chevrolet Tavera price is bound to go up like with any makeover. Though the timelines of the launch is not yet revealed, the new Chevrolet Tavera is most likely to be unveiled at the 2012 Auto Expo. This change is basically to make the Chevrolet Tavera engine BSIV norms compliant as the outgoing car is not offered in the BSIV cities anymore. However, the exteriors does not carry much of a variation and continues with the same dual tone color combination. A redesigned grille and retouched headlamps cannot be ruled out to provide a fresher look on an overall. One should not ignore the addition of the alloy wheels that can be clearly made out from the images. Coming to the interiors, the changes are not quite substantial here too. A bit of touches here and there are made as expected of a revamped version. 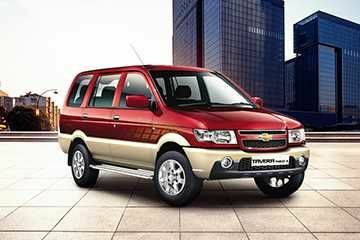 General Motors has announced a price hike of upto 2% on all its car models including Chevrolet Tavera. But it is not until January that the price increase will come into effect. However Chevrolet Beat is the only model to see an immediate raise of Rs 15,000. That’s because the Chevrolet Beat was offered at an introductory price to begin with. This explains the auto major’ s decision to implement an immediate price hike.